Donate to Planned Parenthood Action Fund. I'm stepping up to help Planned Parenthood Action Fund hold out-of-touch lawmakers accountable. Stand with us. P.S. Contributions or gifts to Planned Parenthood Action Fund are not tax deductible as charitable contributions or as business expenses under IRC Section 162(e). 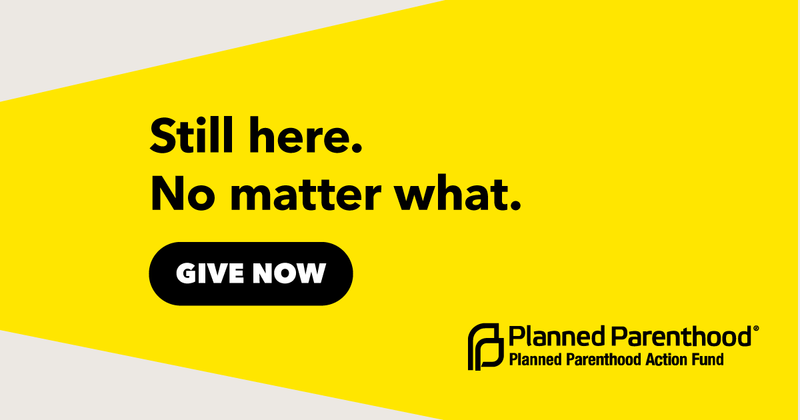 Contributions or gifts to Planned Parenthood Action Fund are not tax deductible as charitable contributions or as business expenses under IRC Section 162(e). Email contact.us@ppfa.org or call 1-855-789-7723 Monday - Friday 9 AM - 5 PM ET. A minimum contribution of $10 qualifies an individual for annual contributing membership in the Planned Parenthood Action Fund. A contribution of $300 qualifies you for lifetime membership. By providing your contribution you are affirming that you are a U.S. citizen or a permanent legal resident of the United States, and that you have used your own funds to make this gift and not the funds of another person or corporation. Sorry, no contributions from business corporations may be accepted. Information about your contribution may be made publicly available.